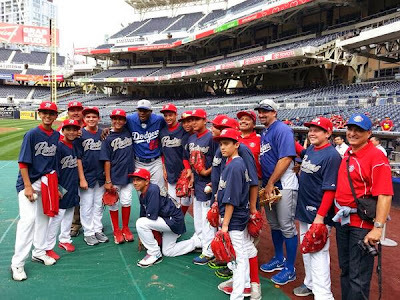 Yasiel Puig and Adrian Gonzalez met with the Little League kids from Tijuana yesterday in San Diego. Pic via @Dodgers twitter. Just check out some of the great photos Hanley Ramirez posted up on Instagram from the celebratory night out on Thursday in San Diego after clinching the division title, here. "Mattingly 'taken aback' by outrage over pool party," via Ken Gurnick at MLB.com. "That celebration is the culmination of a long, long season and it's like Little League when you win," Mattingly said. "It's exciting. That stuff is spontaneous. I don't think it was planned to disrespect anybody or embarrass anybody. Everybody was gone, maybe 100 fans were left. We weren't rubbing it in anybody's face. "Kemp and Puig won't see fastballs all postseason ," via Inside Dodger Baseball. It got me thinking about the opposing pitchers' strategy against these two come October. It's pretty obvious: feed them sliders, and don't put a fastball anywhere close to the plate. Both guys might hang themselves if pitchers stick to that plan. Vin Scully won't be on televisino for the postseason, but you can hear him on the radio, via Arash Markazi at ESPN. Scully will call the first three innings and the last three innings, including extra innings, of every Dodgers playoff game on the radio. Rick Monday and Charley Steiner, the Dodgers' radio broadcasters, will continue to call the middle three innings of games during the postseason. "I'll do the front three and the back three," Scully told ESPNLosAngeles.com on Friday. "Charley and Rick will do the middle three. I'm just going to do what I would normally do." "Fred Claire On Dodgers' Past And Present," via Zach Links at MLB Trade Rumors. So, are you a huge "Breaking Bad" fan? So big that you want to own a piece of the show? Well, now's your chance. Up at ScreenBid, an auction site for movie studios to sell their wares, you can now bid on some very iconic items for your own collection. Go here to check it out. The copy of Walter White's "Blades of Grass" book inscribed by Gustavo Fring can be found here.